we had a paella party. i spent with nuria’s family in barçelona. there was always something to eat. and one of the things he made was paella. i am able to convince nuria to make it for me. i’m getting my fill of paella. *note: this was all nuria, i stuck my head in a few times to take pictures but she did all the cooking. from what i gathered, make sure you have your mise en place together. carefully detach heads from shrimp, using your hands, don’t cut it and in a small pan infuse the heads with the olive oil for 20 minutes. do not bring the oil to a strong boil, aim for a light simmer. meanwhile, in a big pot add in the stock, saffron (or tumeric), white wine and marinara. strain the olive oil from heads, set aside the infused olive oil and add the heads to the pot with the stock to simmer for 30 minutes, covered. in a pan sautee these items separately, but use the same oil and pan: fish, squid, and meat, with a pinch of salt and garlic. mise en place each item. in the pan that will be used to make the paella, heat the rice with the shrimp-infused olive oil, medium-high heat. make sure each grain is coated and warmed through. all the while the stock should be at a light boil, the key is to keep the stock and rice at the same temp. add 1-2 ladle-fuls of stock into the pan, enough to cover the rice. the rice will absorb the stock gradually, like cooking risotto. stir every 102 minutes to prevent scorching. as the stock is being reduced and absorbed, continue to add ladle-fuls of the stock to the pan, stirring as well. at around the 10 minute mark, add the fish, meat, and squid. cook for 5 more minutes. when the rice is still on the al dente side but is just about to get soft, around the 14-15 minute, add the scallops, mussels and cleaned shrimp. place the mussels and shrimp following the same pattern as a bike tire with 6-8 spokes. now leave the pan alone, don’t stir it, but keep the pan moist by adding stock, a ladle at a time. the cooking time of the sushi rice should be around 18-20 minutes. turn off stove, remove pan from heat, add the lemon wedges and the roasted red pepper strips, cover sand ignore for 5-10 minutes. 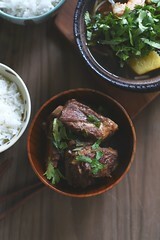 the rice will continue to absorb the stock and cook in those minutes. serve immediately. any leftovers can be eaten at room temp. 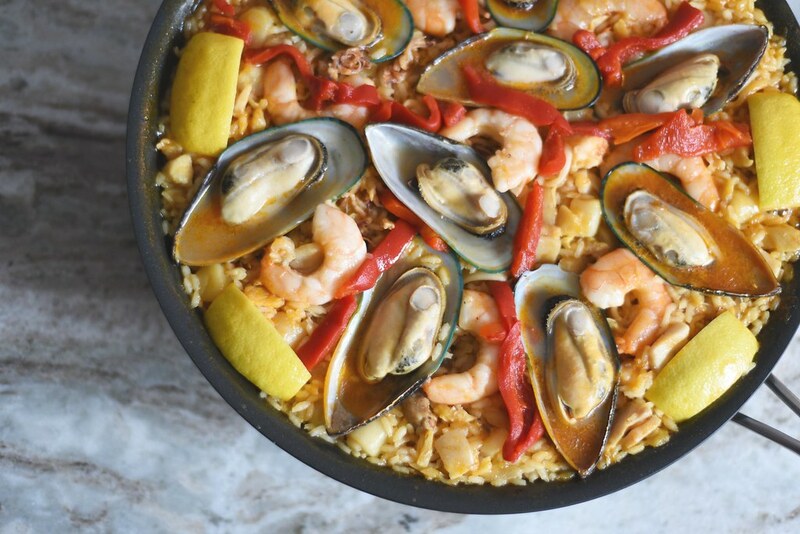 I love paella, but I really love fideua–one time when we were staying right outside Barcelona we when to this place that would do both so we had one of each, and it was fantastic. Making it is fun, but you’re right in that you absolutely have to have your mise en place ready (including making the sofrito ahead of time because the onions need time to really cook down and caramelize). 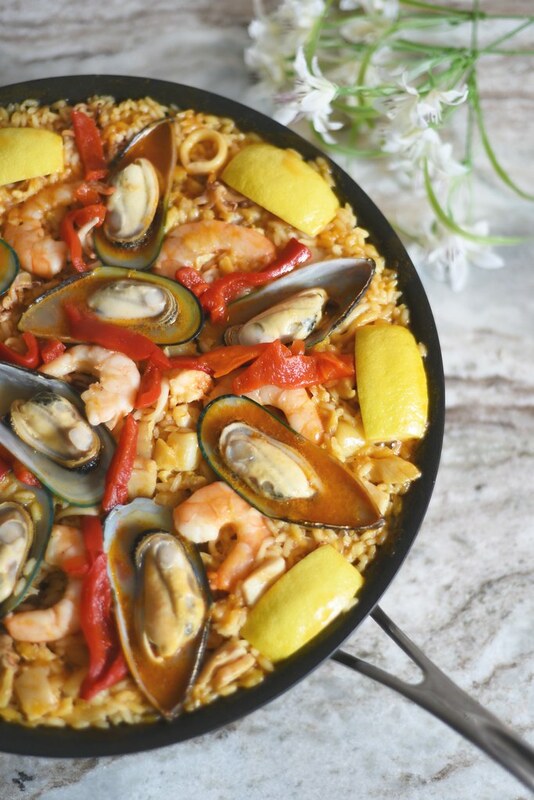 Stunning paella. What a treat. 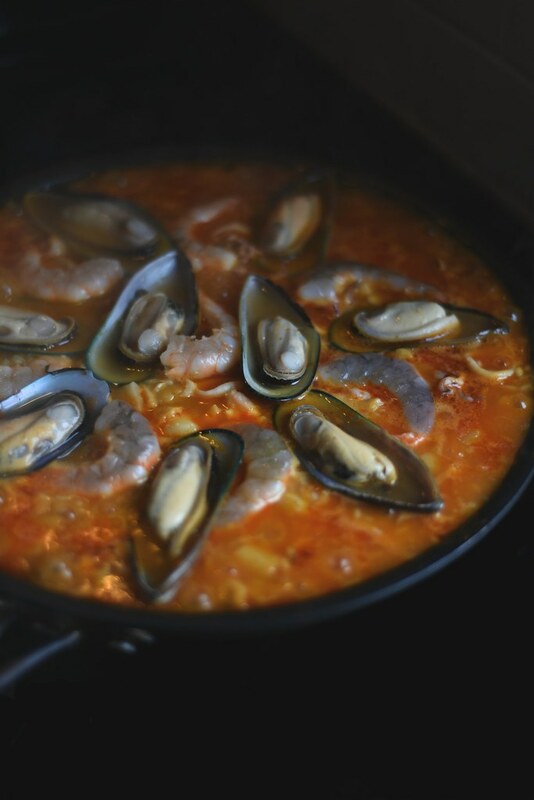 I love paella so much I just want to jump through the screen and eat it!! This is one of the most beautiful bites I’ve seen all week!